It's spring, and once again I made the annual pilgrimage to the Humana Festival of New American Plays at Actors Theatre of Louisville (ATL), which came to a close this past Sunday (April 7, 2019). As we have done for the past few years, my fellow KDHX critic Tina Farmer and I posted instant video blog mini-reviews from the festival on YouTube. We're also posting our own individual festival reports. Here's mine. This year the festival consisted of five brand new plays. Four were performed by ATL's resident professional company and the fifth, as usual, by the members of the Professional Training Company. This year the productions and scripts were of such high quality that I abandoned my initial plan to rank them and instead I'm just reviewing them in the order in which we saw them. The setup: In an Iraq beset by decades of war and occupation, Jawad (Arash Mokhtar) faces a difficult choice. Must he follow in the footsteps of his father (J. Paul Nicholas) washing the bodies of the dead--an honored Muslim tradition--or can he pursue his dreams of being an artist? His uncle Sabri (also played by Mr. Nicholas) made the break and went to live in Europe; why shouldn't he? The story of a young man in conflict with his father because he feels called by the arts rather than the family business is an old one, but placing it in a nation being destroyed by continual warfare put a very different spin on the familiar tale. The fact that the family business is also a quasi-religious calling added even more depth. Jawad isn't just being asked to run the family store; he's called to help the souls of the dead move on to meet God. The stakes could hardly be higher. Mr. Khalidi and Ms. Wallace crammed a lot of story into the play's one hour and forty minute running time, including subplots about Jawad's lover Reem (Mehry Eslaminia), Jawad's relationship with his brother Ammoury (Gus Cuddy), who plans to become a doctor but is killed in the war, and Jawad's friendship with security guard (and eventually fellow soldier) Basim (Abraham Makany). I assume they're all in the original novel, but overall it felt like the authors were trying to stuff too much story into a long one-act. Still, it was a compelling and sometimes emotionally wrenching story. Seeing America's video game wars in the Middle East from the perspective of Iraqi people trying to get on with their lives is a reminder that our actions have consequences that we have found far too easy to ignore over the decades. The strong performances by everyone in the cast had a lot to do with the impact of "The Corpse Washer". Mr. Mokhtar was very credible in a large and demanding part and Mr. Nicholas did an excellent job keeping the roles of Father and Uncle Sabri distinct; ditto Diana Simonzadeh as both Mother and a guard later in the show. "The Corpse Washer" isn't an overtly political play but, as Hannah Rae Montgomery writes in her program notes, "fostering empathy for underrepresented narratives is a vital part of what theatre can accomplish." Sometimes empathy itself is a political act. The setup: Beneath an LED display promising "The Black Experience (tm)" in a cheesy "Soul Train" font, The Black Historian (J. Cameron Barnett), in an equally cheesy gold leaf sports coat, confesses that he's not actually a historian and has never met another black person. But a bunch of white historians with money are paying him to deliver Authentic Black History and, by golly, he's going to deliver. What followed was a raucous send-up of a wide range of mass media stereotypes of The Black Experience (tm), including a tacky TV sitcom complete with laugh track, a talk show about black people addicted to dating white people, and an absurd rap competition. Barack Obama (played by the Historian) made an appearance, and eventually even the playwright (played by Galen Ryan Kane) took the stage to put his personal stamp on The Black Experience (tm) with a touching story that may or may not be true. There was even a final loopy dance number. I was reminded bit of Robert Townsend's 1987 film "Hollywood Shuffle," which took aim at the cartoonish boxes into which white Hollywood liked to stuff black actors, but Mr. Harris's agenda was broader, including an explicit critique of the very notion of historical authenticity. As he said in an interview earlier this year for San Diego CityBeat, the play "is tracking theater as a method of storytelling and history as a method of storytelling, and asking how do we reconcile the two of them?" "Everybody Black" was something of a theatrical carnival, and if it didn't completely come together, there was a lot of awfully entertaining stuff in it. And it did raise interesting issues about the way fact and fiction get commingled when we try to tell our stories. I think Mr. Harris went too far in suggesting that there's no difference between history and his (or anyone else's) story, though. Aside from Mr. Barnett and Mr. Kane, the stunningly versatile cast for "Everybody Black" consisted of Ashley N. Hildreth, Sharina Martin, NSangou Njikam, and Christina Acosta Robinson. They took on around 40 characters during the show's two-hour run time and did so with such credibility that they created the illusion of a large ensemble. The setup: Everyone who ever died is here, just in a different part of here. And if you listen, really listen, you can hear them--in the thin places--the places where the line between our world and some other world is very thin. It's like if you were to imagine an octopus in an aquarium, pressed up against glass...except that there's no glass, and no octopus. This remarkably compelling and creepy play began by shamelessly (and successfully) violating one of the rules of playwriting: show, don't tell. As the lights came up, mousy and timid Hilda (Emily Cass McDonnell) told us, at great length, about a telepathy game she used to play with her grandmother and how it so incensed her mother that grandma got banned from the house. Despite Hilda's timid demeanor, the story was pretty gripping. Then she talked about how her meeting with a professional medium, Linda (Robin Bartlett) led to a friendship of sorts and invitations to parties with Linda's somewhat mysterious friends Jerry (Triney Sandoval) and Sylvia (Kelly McAndrews). We saw Linda "reading" a room. We saw her explain to Hilda that it's all an act. We saw Hilda fade into the background in a party with the voluble Jerry and opinionated Sylvia. Then Hilda was finally coaxed into talking about her mother and things took a sharp turn toward the weird. Everything about this production was perfect. Mr. Hnath's characters are sharply and credibly drawn, and the combination of his intelligent script and Les Waters's impeccable direction delivered all the chills you could want from a proper theatrical ghost story. The cast was excellent, headed by Ms. McDonnell's compelling Hilda, who gave the character a near-spectral shyness that became progressively more unsettling as the play progressed. Mr. Hnath designed "The Thin Place" specifically for Actors Theatre's Jory Theatre, but it looks like a piece that could easily be produced by almost any small theatre. Don't be surprised if it shows up on a stage near you in the next year or two. The setup: Your body is a weapon. So says Brandi (Anna Crivelli), who starts teaching sorority pledges Mojdeh (Ariana Mahallati) and Diana (Gabriela Ortega), shy student Nikki (Molly Adea) and sorority sister Kara (Abby Leigh Huffstetler) self-defense after fraternity brothers assault one of Brandi's sorority sisters. 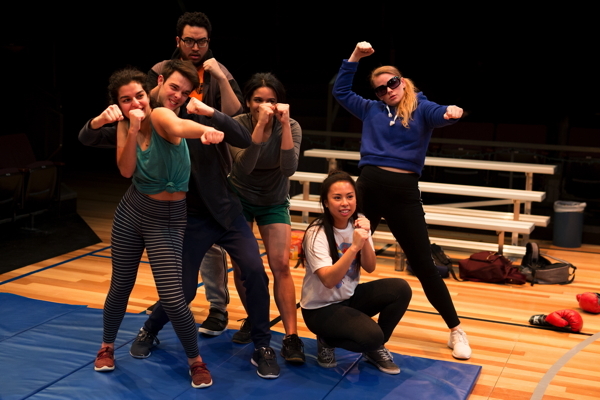 Male classmates Andy (David Ball) and Eggo (Jonathan Moses Olivares) show up to show their support, and the group learns how to fight back, while wrestling with their own complicated experiences and desires. A play dealing with issues like toxic masculinity, consensuality, and the ways in which women have been conditioned to accept being pushed around could easily become strident or preachy. This one didn't mostly because Ms. Padilla created characters that looked and sounded entirely real. Her female characters dominated the story, as they should, but Andy and Eggo were also drawn with enough depth to insure that they didn't become cartoon bad guys. The actors all completely inhabited their characters with uniformly strong performances. I was especially struck with the way Ms. Adea's Nikki moved from near-invisibility to rage as she realizes that Brandi's promises might not match up with reality, but everyone did fine work here. Kudos are also due to Movement Director Stephanie Paul and Fight Director Drew Fracher for their effective combat choreography. "How to Defend Yourself" fell apart a bit at the end, with a final scene that did a quick rewind through the life of the unseen assault victim, Suz. It made a valid point about the ways women can be conditioned to accept unwanted attention from childhood, but it felt a bit disconnected from the rest of the play. Still, this is an important script with plenty of food for thought, and it deserves a post-festival audience. The setup: Fads, cults, and irrational beliefs that defy reality are the subject matter for this collection of six short one-acts performed by members of the Professional Training Company. In an interview with my colleague Tina Farmer, the three playwrights talked about how their scripts for "We've Come to Believe" were developed independently, based on an information packet they each received about the theme behind the show. Director Will Davis then put it all together. That might explain why "We've Come to Believe" didn't necessarily work as a whole, although parts of it were certainly fascinating. Ms. Cothron's "Pure Love Now" tackled the theme of cults head-on with a sharp parody of groupthink and her "Our Impact on the World," was a trenchant observation of the dark side of social media. Mr. Olmos's three plays--"the asleep," how do the lonely live," and "the awake"--were more oblique in their take on witch hunts (literal and figurative). Ms. Feldman's "Winning at the Games of Life" was perhaps the most satisfying of the lot, with its incisive takedown of the mindless psychobabble of self-help gurus and corporatespeak. The performances by the student ensemble were polished and solid. Director Davis, though, was a bit too fond of having his cast create elaborate patterns on the darkened stage with luminescent socks and light-up sneakers. It was visually arresting, but it wore thin eventually. The quality of the scripts at Humana can be variable, but this one of the strongest collections I have seen there. To paraphrase rock critic Jon Landau, I have seen the American theatre's future, and its name is the Humana Festival.